It's time to start cutting some timber. Good, I hear you say, but why are we getting all this comment and theory rather than getting out there with chisel and plane and actually making something? Well, I'm sorry, but all successful projects start with a planning stage, and part of that is learning which are the correct tools and how to use them. The first job after taking delivery of the timber is to sort it into usable and unusable pieces and decide which piece will do for which component. This is where you need a large sheet of paper and a sketch, or one of our Plans & Projects plans! 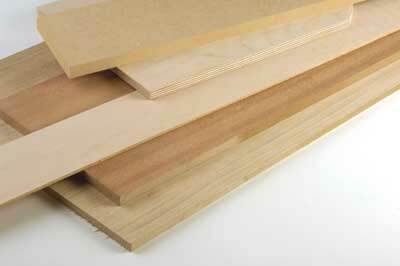 Essentially you will be using either solid timber or board material. Solid wood is easier to deal with so we will start with that. DIY sheds sell timber which is sometimes unusable because it is twisted or banana shaped, so professional woodworkers usually buy it from timber merchants. Don't be afraid to ask these experts their advice; they want you to come back again so they are most likely to be friendly! 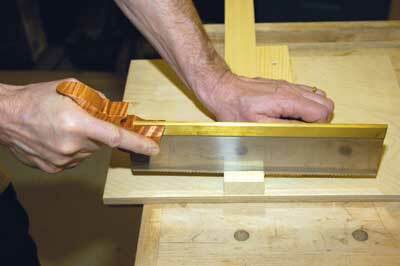 But wherever you go for your timber, look down each length and check that it is straight. Board material is easier! It is manufactured in nominal 8 x 4ft sheets (2440 x 1220mm in metric) and it starts life flat. The DIY houses supply it in half-sheet increments and most will cut a large sheet down for you free of charge but you will have to pay for the whole sheet. Timber merchants should do the same. Generally speaking the sheet has to be cut to get it into the car so measure your vehicle first and work out what is the largest size that your vehicle will accommodate. There are lots of types of board. To start with use good-quality interior ply; don't use shuttering ply because it is too coarse, or marine ply because it is too good and very expensive. Stick to standard interior-quality plywood. Pine comes in a variety of cross-sections including 25 x 50mm (1 x 2in but conventionally called 2 x 1 by timber merchants!) and 100 x 50mm (4 x 2in). Just be aware that size as sold may not be the exact size that you get! This is due to the use of the little word 'nominal'. 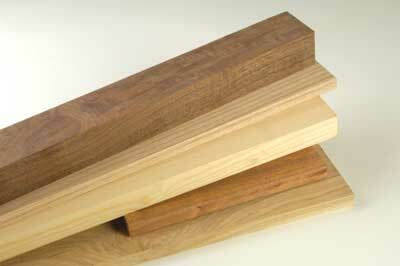 Timber is sold with planed surfaces, known as 'planed all round' or PAR for short. You, the customer, pay for this planing, and so the merchant charges you for the size of the timber before planing. 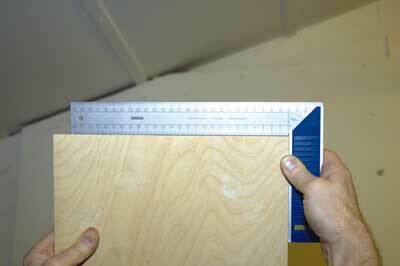 Therefore what starts off as 25 x 50mm may end up 22 x 47mm. Knots in timber are normal. Knots occur where branches grew. 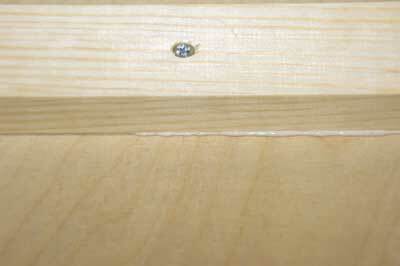 Resin is common in pine and if you can't avoid the resin pockets, at least have them facing away from the front. Right, let's cut some timber. 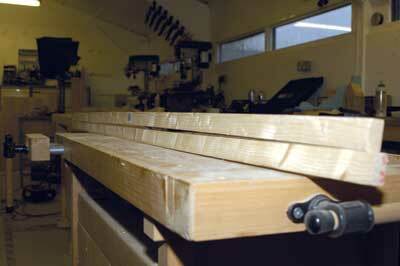 Pick a good piece of 25 x 50mm and put it on the bench or Workmate. You need to cut a clean end because the chances are that the end of the bought timber is rough, painted red, and perhaps split. 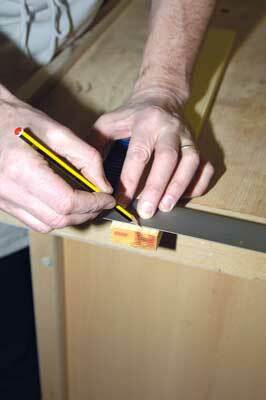 Find a clean surface and, using a square and a sharp pencil, mark a line right around the timber. Set the timber on the bench, try to start the saw cut on the pencil line and you will find that the timber slides on the bench. 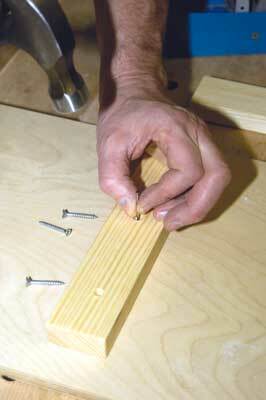 What you need is a bench hook. 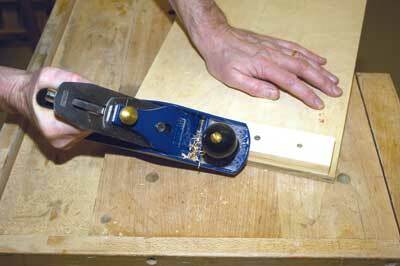 Now how you make a bench hook when you haven't got one in the first place was never explained to me all those years ago. I guess you just have to manage somehow using cramps or a friend to hold the timber. A small piece of timber like the piece I am using to make the fence on my bench hook should really be cut with a backsaw. This is because the brass back gives more control and the smaller teeth, which equate to more teeth per inch (tpi for short), leave a less ragged finer cut. Once the ends have been cut clean all the way around, remove any raggy bits with a flat file. Always file with the grain so that the wood fibres being cut are supported by other wood fibres below them. Think of the bundle of fibres that make up your piece of timber as a bundle of drinking straws. Without support underneath the outer ones would break if bent. 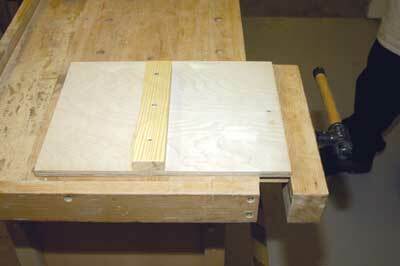 Set aside the piece of 2 x 1 which will become the fence for your bench hook while we make a baseboard. 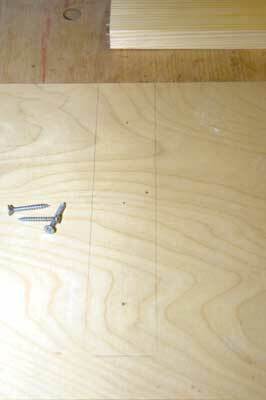 Any scrap of flat board which is 12mm (1/2in) thick or more will do. 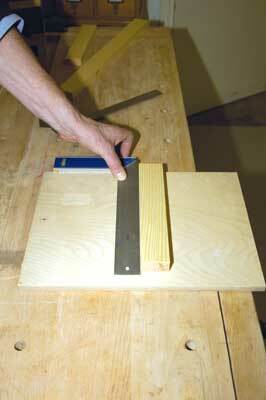 If the board corners are not square, use the best edge that you can; we will deal with planing square in a later article. Lay the clean fence onto the baseboard using the square to set it at right angles to the long side of the baseboard, then mark around it with a pencil. I have made a right-handed bench hook with a space on the right for the saw; left-handers will need to leave the saw space on the left. 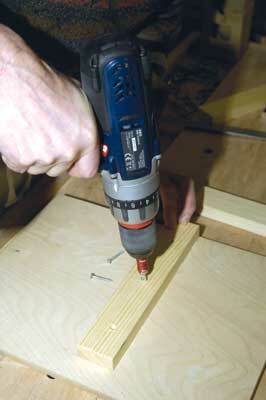 Next, drill holes for the screws and countersink the holes to take the screwheads. Now we know the position that the fence will take on the baseboard we can drill some holes for the screws and countersink the screwholes to take the screwheads. 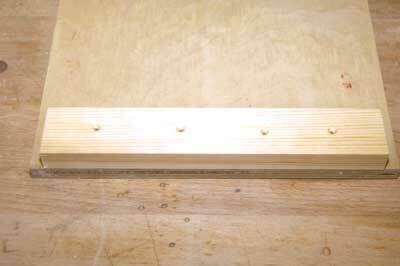 Lay the timber back on the baseboard in the correct place and, using a long panel pin, mark through where the screw will come out onto the baseboard, then use a smaller drill than you did for the clearance holes in the fence to make a tiny pilot hole in the baseboard. 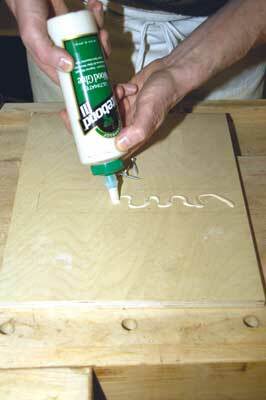 Place a squiggle of glue on the baseboard in the marked area. Insert the centre screw and drive it through until it just protrudes, then use this protrusion to feel for the pilot hole in the baseboard. 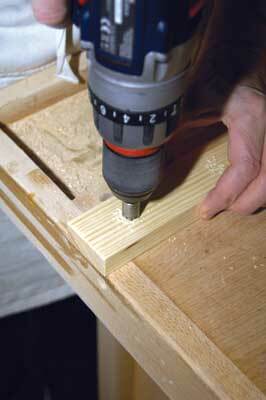 Once located, square up the fence with the pencil lines and gently drive the screw home. Next we need a hook in order to locate the baseboard over the edge of the bench. Repeat the processes above so that you have a hook. 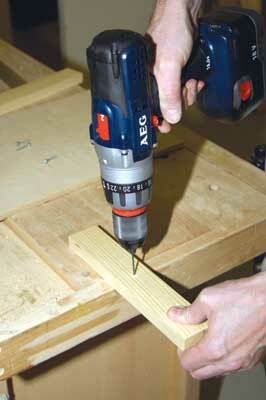 Drill and assemble as before - it will be easier the second time! As an added refinement of technique you could clamp the hook in place to stop it slipping around. 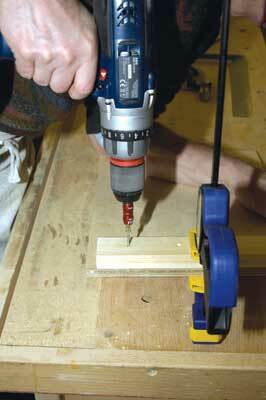 Tighten the clamp until it just grips and then tap the timber into exact place with a hammer before tightening the clamp fully. Once all is secure and the glue wiped off with a wet rag, relieve the edges with a plane, sandpaper or a general-purpose file to complete your first project. "Wherever you go for your timber, look down each length and check that it is straight"
Nowadays handsaws come ready sharpened with hardpoint teeth which cannot then be re-sharpened. Once the saw has gone blunt it is time to throw it away or transform the blade into a scraper. 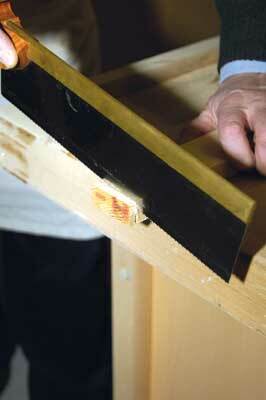 Saws come with brass or steel backs, known unsurprisingly as backsaws, or without backs, known as handsaws. There is also a new variety called a toolbox saw because it will fit in the standard plastic toolbox. 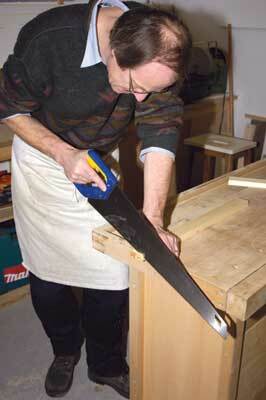 You need one backsaw, probably sold as a tenon saw, and one handsaw. Don't just chuck them in the toolbox to get blunted and bent but hang them up. NEVER lay a saw flat on the ground where it can be walked on. 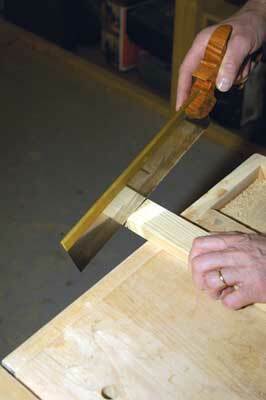 Relatively new to the UK are pullsaws which cut on the pull stroke rather than the push stroke. I think that to begin with it is better to stick to one of the two types, either push or pull, but don’t confuse yourself by trying both.